This is a famous dish in Thailand and is very easily and quickly prepared. 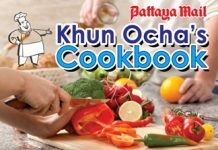 If you come from overseas, it would be an ideal dish to “show off” your Thai culinary skills, on a trip “back home.” None of the ingredients are difficult to find and any overseas supermarket will have chilli or dried chilli freely available. Hard boil the eggs in water for about 8 minutes. Rinse in cold running water and remove the shells. In the wok, heat the oil and deep fry the eggs, turning them carefully. Remove from the hot oil when they have a light golden brown colour. Allow to drain and cut in halves lengthways. In a pan, heat the stir-fry oil. Slice the onion and fry until crisp and brown and remove and drain. Now lower the heat under the wok and add the fish sauce, sugar and chilli, stirring slowly until the sugar is dissolved. Now add the onions and stir fry for another minute. Remove and pour over the halved eggs and serve immediately.